Karen Bakker is an old hand at tracking the expansion of private control of water utilities in the 1990s by companies such as Bechtel, Enron and Vivendi (now Veolia). She has also researched the more recent shift towards public private partnerships (PPP) in water supply. 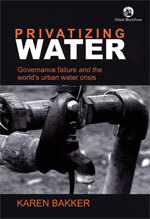 In her latest book, Privatizing Water: Governance failure and the world's urban water crisis, Bakker argues that restricting the debate to the binary of public versus private is not only futile but also stalling the search for socially acceptable models of urban water supply. The book’s opening scene harks back to an infamous incident at the World Water Forum held at the turn of the century in The Hague: two people stripped on stage to expose messages against privatisation of water inked on their bodies. Several such examples in her book highlight the polarised positions that have dominated the debate on urban water supply in the past two decades. It traces the debate to an era when water utilities got locked in a vicious cycle of poor cost recovery, low tariff, declining investment, overstaffing, poor service and consumers unwilling to pay. Private companies were deemed as the panacea. It was hoped they would provide finance, mobilise quality expertise and become agents of reforms, resulting in conservation of water. In reality, the panacea generated fierce controversy; there were violent clashes between people and authorities in some places. The anti-privatisation camp argued that government-run systems could be more effective, equitable and responsive to people, when properly supported. Refreshingly, Bakker refuses to take sides: “We cannot categorically refute private sector involvement in water supply, nor simplistically defend government provision,” she writes. Both sides have some success stories and many failures. Today, nearly a billion people lack access to adequate water supply, and neither the government nor the private sector seems willing to budge from its stance. 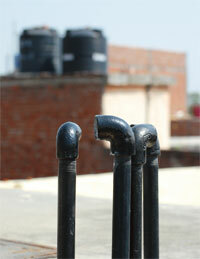 An important indicator of a well-managed piped water network is provision of water to low-income localities. Bakker regards the inability to provide such services as a significant failure of the first wave of privatisation. The question, however, remains: can we transcend the public-private binary in the search for models of public goods provision? Bakker does develop tentative answers that bring in the role of the community and the issue of water as a human right. But the book does not answer the question substantially. It, nevertheless, is a starting point for more fruitful engagement on the subject. The book’s goal “is to draw the reader into a broader conceptual space in which our criteria for alternatives to conventional public and private approaches can be refined, and in which wide-ranging debate over urban water governance can flourish”. Bakker is provocative and insightful but she fails to break away from her academic avatar to make the text reader friendly. Even then, the book demands space on the shelves of utility managers, activists and private sector proponents seeking grist for the mill.